NEW ORLEANS – It has been a little more than seven weeks since the 2019 NCAA Division III Indoor Track & Field season got underway on December 1. 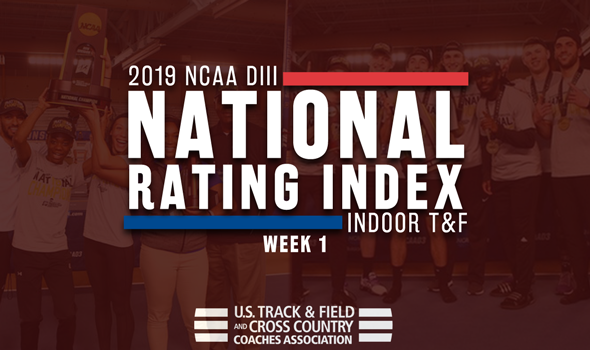 Athletes are beginning to settle into their groove – and with that known, it’s time to check out the National Track & Field Rating Index (TFRI) to see how things are shaking out around the nation. Be sure to set aside time on March 9-10, because that’s when the 2019 NCAA Division III Indoor Track & Field Championships will be held in Boston at the Reggie Lewis Track and Athletic Center. It continues to be a two-horse race on the men’s side, but the order of those competitors switched between the preseason and Week 1. North Central (Ill.) surged ahead of UW-Oshkosh and is now the top-ranked team in the nation. The Cardinals, who have now been ranked No. 1 nine times since 2017, received strong performances from Dylan Kuipers and Nolan McKenna to push them forward. Kuipers cleared 5.01m (16-5¼) in the pole vault at the Cardinal Classic to move up to third in the TFRI Individual Rankings, while McKenna clocked a time of 14:19.31 in the 5000 at the same meet to improve his spot in the TFRI Individual Rankings to third as well. UW-Whitewater jumped back into the top-5 for the first time since 2017 after starting the season ranked ninth. The Warhawks are looking for big things in 2019 from junior Robert Starnes, who is ranked No. 1 in the TFRI Individual Rankings in the high jump and fourth in the long jump. Don’t forget about Zach Jasinski or Alex Duff either, as the former is a top threat in the pole vault and the latter is a do-it-all heptathlete who could also score in the 60 hurdles and long jump. Haverford is another team that improved a few spots from the preseason. The Fords are ranked sixth, which is their best ranking since the 2014 season. Haverford’s strength relies in the mile, 3000 and 5000 as Dylan Gearinger, Greg Morgan and Graham Peet are all expected to finish in the top-8 in at least one of those events at NCAAs. The biggest gainer in the men’s rankings this week is Wabash. The Little Giants soared 64 spots from No. 110 to No. 46 between the preseason and Week 1. Top-ranked Williams put a little bit of distance between itself and the rest of the nation. The Ephs, who had 139.91 points in the preseason, pushed that total to 146.65 in Week 1. Anna Passannante gave Williams the biggest boost after she clocked a time of 4:55.31 in the mile at a tri-meet between her squad, Amherst and Wesleyan and is ranked sixth in the TFRI Individual Rankings at this point of the season. Washington (Mo.) and Johns Hopkins are separated by less than one point at No. 2 and No. 3, respectively, which is a virtual tie according to the TFRI. The Blue Jays made up some ground on the Bears after Maya Hammonds uncorked a mark of 5.80m (19-0½) in the long jump at the Great Dane Classic and moved into the No. 2 spot in the TFRI Individual Rankings in that event. Nebraska Wesleyan worked its way into the top-10 for the first time this season following Dayton Dolincheck’s effort at the Polardog Indoor Invitational. Dolincheck heaved the shot 14.29m (46-10¾) and is now ranked third in the TFRI Individual Rankings. The biggest gainer in the women’s rankings this week is Springfield (Mass.). The Pride went from No. 146 to No. 82, which is a 64-spot improvement since the preseason. MEN | WOMEN Mar. 9-10: NCAA DIII Championships, Boston, Mass.